In the Life of Paul the Hermit by Saint Jerome, written in the year 374 or 375 during Jerome’s stay in the desert of Syria, we read how Saint Anthony was on a journey in the desert to find Saint Paul of Thebes, who according to his dream was a greater and more perfect desert-dweller than he. 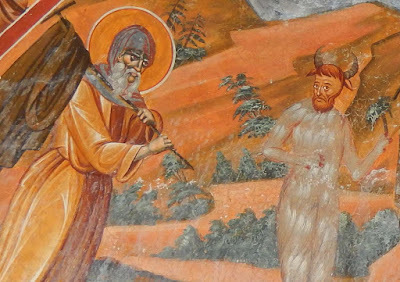 Saint Anthony had been under the impression that he was the first person to ever dwell in the desert; however, due to the dream, Saint Anthony was called into the desert to find his "better," Saint Paul. On his way there, he ran into two creatures in the forms of a centaur and a satyr, which are considered to have been demonic temptations, although Jerome seems to be open to the possibility that they may have been monstrous creatures of the desert, of which he says that one such creature was seen alive in Alexandria during the reign of Constantine the Great. At any rate, he was stopped by creatures of the desert, a satyr and a centaur, and he asked them, "Who are you?" To that the satyr replied, "I am a corpse, one of those whom the heathen call satyrs, and by whom they are snared into idolatry." The satyr then tried to terrify the saint while the centaur acknowledged the overthrow of the gods. 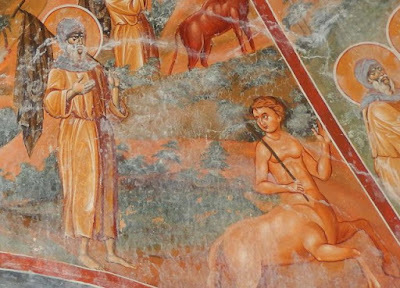 In the end, the centaur tried to show Saint Anthony the way to his destination while the satyr ended up asking for Saint Anthony's blessing. 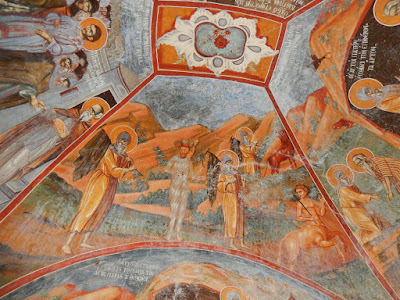 The frescoes here posted come from the Skete of Saint Demetrios, which belongs to Vatopaidi Monastery at the Holy Mountain. The blessed Paul had already lived on earth the life of heaven for a hundred and thirteen years, and Anthony at the age of ninety was dwelling in another place of solitude (as he himself was wont to declare), when the thought occurred to the latter, that no monk more perfect than himself had settled in the desert. However, in the stillness of the night it was revealed to him that there was farther in the desert a much better man than he, and that he ought to go and visit him. So then at break of day the venerable old man, supporting and guiding his weak limbs with a staff, started to go: but what direction to choose he knew not. Scorching noontide came, with a broiling sun overhead, but still he did not suffer himself to be turned from the journey he had begun. Said he, “I believe in my God. Some time or other He will show me the fellow-servant whom He promised me.” He said no more. All at once he beholds a creature of mingled shape, half horse half man, called by the poets Hippocentaur. At the sight of this he arms himself by making on his forehead the sign of salvation, and then exclaims, “Holloa! Where in these parts is a servant of God living?” The monster after gnashing out some kind of outlandish utterance, in words broken rather than spoken through his bristling lips, at length finds a friendly mode of communication, and extending his right hand points out the way desired. Then with swift flight he crosses the spreading plain and vanishes from the sight of his wondering companion. But whether the devil took this shape to terrify him, or whether it be that the desert which is known to abound in monstrous animals engenders that kind of creature also, we cannot decide. Anthony was amazed, and thinking over what he had seen went on his way. Before long in a small rocky valley shut in on all sides he sees a mannikin with hooked snout, horned forehead, and extremities like goats’ feet. When he saw this, Anthony like a good soldier seized the shield of faith and the helmet of hope: the creature none the less began to offer to him the fruit of the palm-trees to support him on his journey and as it were pledges of peace. Anthony perceiving this stopped and asked who he was. The answer he received from him was this: “I am a mortal being and one of those inhabitants of the desert whom the Gentiles deluded by various forms of error worship under the names of Fauns, Satyrs, and Incubi. I am sent to represent my tribe. We pray you in our behalf to entreat the favor of your Lord and ours, who, we have learnt, came once to save the world, and ‘whose sound has gone forth into all the earth.’” As he uttered such words as these, the aged traveller’s cheeks streamed with tears, the marks of his deep feeling, which he shed in the fulness of his joy. He rejoiced over the glory of Christ and the destruction of Satan, and marvelling all the while that he could understand the Satyr’s language, and striking the ground with his staff, he said, “Woe to you, Alexandria, who instead of God worships monsters! Woe to you, harlot city, into which have flowed together the demons of the whole world! What will you say now? Beasts speak of Christ, and you instead of God worship monsters.” He had not finished speaking when, as if on wings, the wild creature fled away. Let no one scruple to believe this incident; its truth is supported by what took place when Constantine was on the throne, a matter of which the whole world was witness. For a man of that kind was brought alive to Alexandria and shown as a wonderful sight to the people. Afterwards his lifeless body, to prevent its decay through the summer heat, was preserved in salt and brought to Antioch that the Emperor might see it.